It's that horrible time of year again- when it's so hot out that the snakes come out of wherever they normally lurk and bite my cats on their legs. Of course, the cat probably asked for it by dabbling at it like a toy, but I would still like to kill that bugger for hurting my baby. No, we didn't kill the snake but only because we never saw it. Our first clue was NP crying in the laundry room, near the door she uses to come and go. 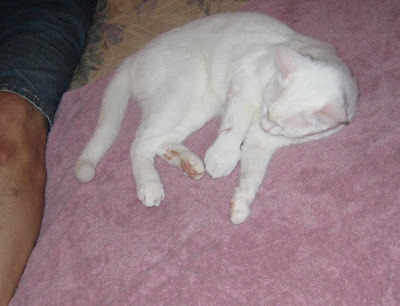 Blood was dripping off her right front leg and she was in so much pain. We first thought broken leg, then we found fang holes. Chit! This was about 1 PM. From previous experience and vet recommendation, we gave her about half of a benadryl (mixed with water, in a syringe, by mouth) and hoped she would sleep the worst of it off. She didn't sleep for a long time, but finally she conked out, getting up about every hour to seek a new spot- under our bed, under the guest bed, by the balcony door, up on my work table, on a dog bed- she was very restless. The swelling got worse after this photo, but I didn't want to stress her by taking more photos. Her paw got so big, I was worried, it got really fat and thick then it started going up her leg, but it peaked and finally started to come down. She was a little better by bed time, drinking water and ate a bit. 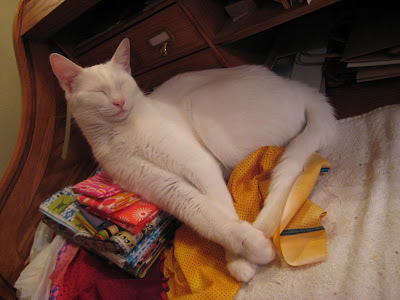 This morning, she is taking it real easy, up on my desk on top of a bunch of fabric that is waiting to be washed. Her daddy went to the vet's office to pick up antibiotics (liquid, won't this be FUN?) and to get Paisley's ashes. I feel another cry coming on. Nosey Parker is going to be OK, thank goodness. We were so worried because we weren't sure what kind of snake it was, we're lucky it was only a copperhead. I doubt that she's learned anything though, because the other cats never did. If it moves, it's fair game, as far as they're concerned. Beez has been bitten at least twice and Freddie Wheat, twice also. I hate $%*&ing poisonous snakes, I'll tell ya that. I sure wish we didn't have any here. Baskets! On a lighter note, I got the first hexie top assembled. I like it! My points cooperated really well, I only chopped the tip off of a couple of them and because I pinned the snot of it when I sewed the rows together, they all lined nicely. A couple of the edges are a little bit full, I'll have to beat it into submission when I quilt it, but I think it's going to be a great little lap quilt. I need some backing material, though. It measures about 46" x 54" or something like that. I have another one the same size and shape to do, next. I'm a little sick of doing it, but I'm forcing myself. I have too many unfinished quilts right now, I don't need another! Oh, Susan, you have had such a tough time of it lately with your furry family! I'm so glad that Nosey Parker will recover. It certainly makes me appreciate that we only have scorpions to contend with right now. Just curious, how much benedryl do you give a cat (i.e. how big was the tablet you broke in half)? I'd like to keep that info on hand in the event that one of the cats actually gets stung by a scorpion, because to them, they are toys that play back, just like the snakes. What's with that NP...doesn't she know you look but don't fiddle with a snake? :) Glad she is doing alright. Thank heavens that she can be so easily treated. I think it is much worse for dogs and I know it is for humans. I hate those darn snakes too. I do love the hexies!!!! Very striking! Oh I do feel for you and NP. Glad she is doing ok. It was my one fear of living in Australia-snakes. So glad we do not have them in NZ and the cat can run around quite safely. Oh my gosh!! How scary for you and your hubby! Not to mention Nosy. I'm glad she came inside to get help instead of crawling away somewhere to cry in pain. Her paw and leg looks huge but you can really see that it was coming down in the last photo. I am so happy everything turned out okay. One of my fears is that Sadie will get out somehow and out here in So.Cal we don't have snakes we have CARS!! I've always had indoor kitties (except when I was a kid and things were a lot safer) because they really don't have a chance out here. I love the hexie quilt. Its not easy to make them all go together so beautifully. Great job! i am so glad that Nosey Parker is going to be ok, Love the Hexie quilt too. Oh I don't envy you having to put up with snakes! So glad we don't have them here. Glad NP recovered. Holy Craptacular Batman! How positively rude of that snake to mess with that precious kitten! She will be ok? yea? Still blow to the ego for the poor girl. Awwww- big arms wrapped around you for the Paisley. I know you miss that pup. Damn animals get into your heart they do. Well sending my love to you all. ooh, poor baby! I was wondering how you could possibly be so casual about it until reading further in that this isn't a rare occurrence. holy cow. I'd have thought she'd be a goner for sure. so glad that isn't the case. 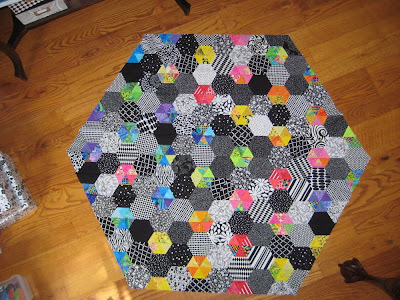 the hexie quilt is purty - love the bright sparklies. I am sooooo thankful that little precious baby is going to be ok!!!!! I sure hope she has learned her lesson for her sake AND your's!!! I'm so glad that NP will recover fully! One can only wonder if she has learned any sort of lesson!? Peaches and Uki don't have snakes (they are indoor girls) or scorpions but little black biting ants! It's true, if it moves it is fair game and they get bit a lot! Peachy more so! She has had all sorts of inflammations from these bites! We have managed to keep them out with this powder stuff as of late. The worst thing about these ants is that if they get ALI, my little boy, he goes straight to the ER!!! The hex quilt is lovely!! I WON a doll quilt! Is an original idea even possible anymore? The mini quilt swap, part 2!